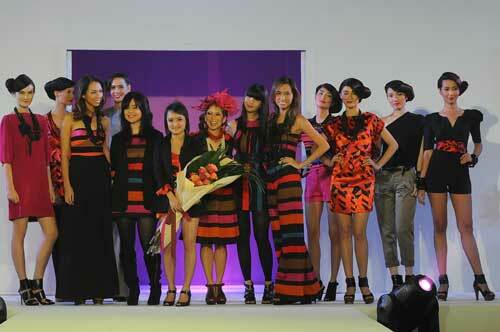 See the fasyon celebs we spotted in this “ode to dressing up” fashion show by the celebrated Pinay designer. Clothing brand Paperdolls collaborated with designer extraordinaire Kate Torralba to create a collection that's reminiscent of every fashionista-to-be child's fondness for dressing up, which also marks their 25th year in the industry. The Rockwell Tent was transformed into a huge doll house, with the stage adorned with bright pink lights, as wine and cocktails overflowed in the audience area. The KT for PAPERDOLLS collection was highlighted by a smattering of orange, fuchsia, blue, and chocolate brown ensembles, as well as a variety of prints on short and maxi dresses, playsuits, top and skirt sets, and asymmetrical pieces--versatile outfits that can take you from the workplace to a nightout. The clothes were presented on the runway by such high-profile muses, including TV host Tessa Prieto-Valdes, real estate princess Divine Lee, model Karen Pamintuan, and Magalona siblings Maxene and Saab. Other celebs spotted at the scene were fashionista Camille Mathay-Farinas, designers Randy Ortiz, Ito Curata, and Ino Caluza, lovely couple David and Mai Kauffman, and Channel V VJ Alvin. The event was hosted by Joey Mead, with Up Dharma Down as guest performer for the night. Kate Torralba herself concluded the night with a special performance. Kate Torralba for Paperdolls is exclusively available in selected SM Department Stores nationwide.